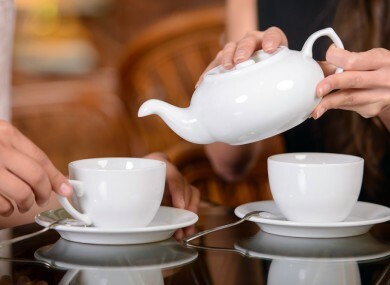 A NEW EUROPEAN level study has found that Ireland still gets most of its caffeine from tea. In the research carried out between 2008 and 2010 by the European Food Safety Authority, it was found that among adults aged between 18 and 65 – tea still beats out all other sources of caffeine. Overall 59.4% of the caffeine comes from tea, 32.5% comes from coffee, 1.3% comes from chocolate, 3.9% comes from cola beverages and 3% comes from energy drinks. When compared with our European counterparts Ireland comes out top of the tea polls – with Ireland giving the biggest preference for caffeine intake. We are followed in second place by our nearest neighbour, the United Kingdom, where 56.5% of caffeine intake comes from tea. Besides the 18-65 age category, the survey also looks at the ‘elderly’ and ‘very elderly’. In the category of ‘elderly’, which accounts for people aged 65 to 75, caffeine intake from tea in Ireland rises to 74.1%. This becomes more pronounced again among the ‘very elderly’, aged 75 years and up. In this demographic 78.5% of individuals got their caffeine intake from tea. Overall, across the continent it is a lot more common for intake of caffeine to come from coffee. In the broad 18-65 ‘adult’ demographic, Finland was the country with the highest caffeine intake from coffee, with 93.8%. Ireland was found to be the second most popular country of those surveyed for consumption of caffeine through energy drinks, after Spain, where 4.2% of caffeine consumed comes from energy drinks. Email “Ireland is basically the European champion of tea drinking*”. Feedback on “Ireland is basically the European champion of tea drinking*”.